Today I made my way into town to do a spot of grown up shopping (I bought my first ever wheelie suitcase - somehow I've managed to get through the last 37 years borrowing luggage from other people). While I was there, and kiddo free, I also had a good old mooch around the shops. Hints of nineties fashion have been making appearances on the catwalk a lot over the past few years but I think it's safe to say its well and truly back again right now. I swear I felt as if I was in my local shopping centre circa 1994 today. 4. Platform sandals in shimmering fabric, £55 - Esprit // Platform sandals were seriously cool in the mid-late 90s. I had a pair just like these from Red or Dead; I lusted after them for ages and it took me months to save up for them! 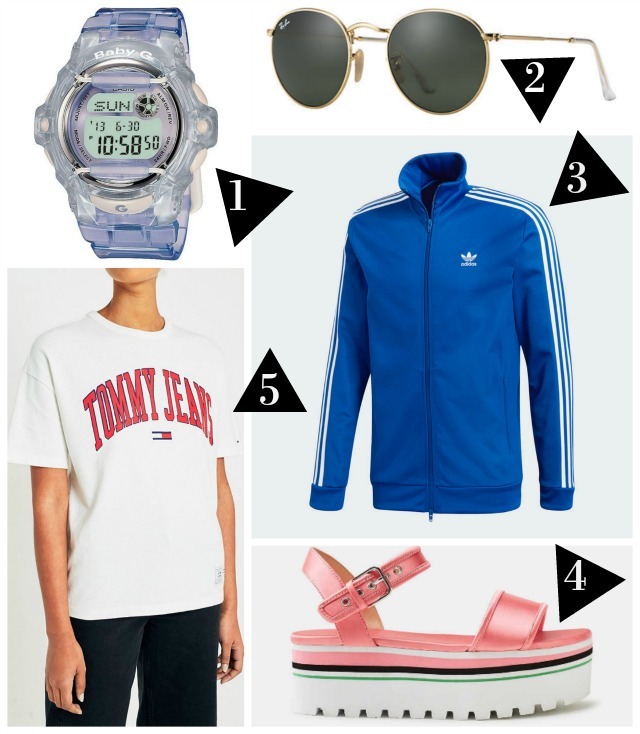 What clothes and accessories do you think of when you reminisce about the nineties?